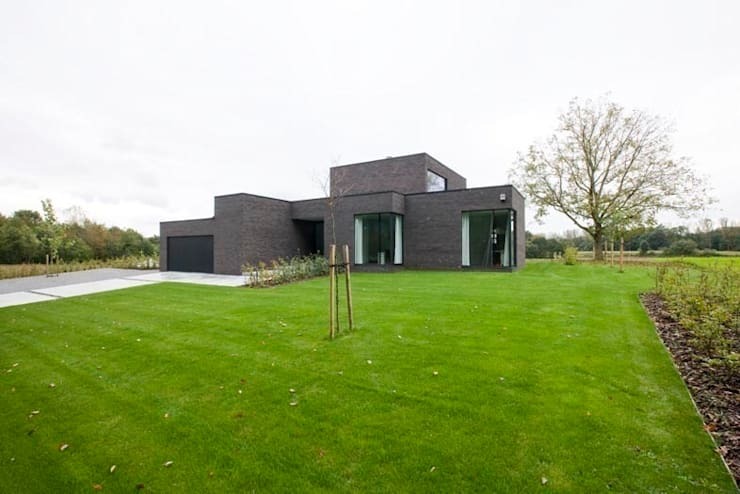 Today we will take you on the tour of a contemporary and spacious house in Overijse, a Belgian municipality. It was originally a 70s building which was remodelled stylishly by the architects at Hasa Architecten BVBA, so that each room can lend stunning views of the verdant landscape surrounding the property. Dark grey on the outside and mostly white on the inside, the residence is equipped with numerous glass doors and windows which integrate the interiors with nature seamlessly. Trendy furnishing and minimalist decor add oodles of charm to this refreshing home. And the backyard wows with a luxurious pool. Composed of simple and modern volumes, the house looks very modern and elegant. Large glass windows allow the sun to penetrate the facade, while a neatly paved driveway leads to the garage. The entrance is concealed and protected from the sun and rain. With beautifully manicured lawns all around and towering trees in the distance, the house offers serene respite from the bustle of city life. 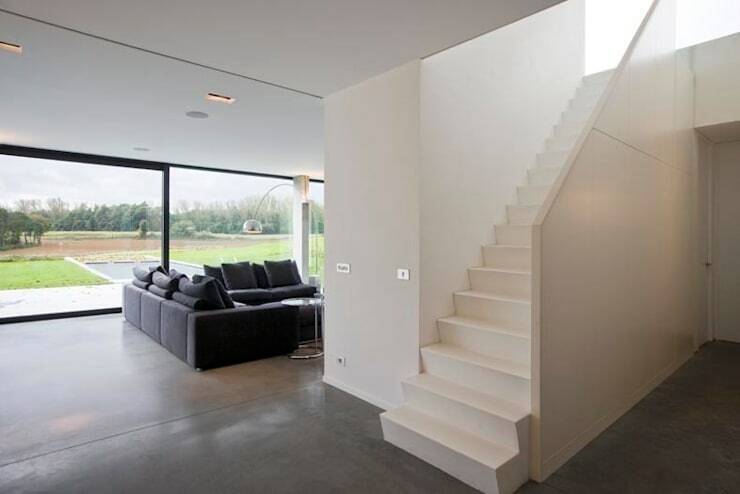 Smooth grey flooring and spotless white walls make the house appear spacious, airy and bright. Massive sliding glass doors bring in sunlight and flood the living area with warmth and cheer. The staircase leading upstairs is a very trendy affair in white, with a sleek balustrade and neat steps. The dining area is nicely integrated with the living space, thanks to the open plan layout of the house. The sleek and white dining arrangement simply shines when the sun rushes in through the stylish glazing. This is a perfect spot for admiring nature while indulging in delicious meals. Smooth white surfaces, fashionable fixtures, sleek designs and stylish lights make this bathroom a dreamy space for rejuvenation. It is separated from the bedroom with massive glass doors which allow a visual feeling of openness. From here, you can also soak in nature’s beauty, thanks to the large glass windows near the workstation. Gorgeously and well-kept green grass makes the backyard a haven for outdoor pleasures like picnics, barbeques, open air dining. A long bank of glass doors create a fabulous visual connection between the indoors and outdoors, while the long pool features beautiful water plants at one end for aesthetic appeal. Hope you derived a lot of inspiration from this contemporary home which believes in openness and love for nature. Check out another tour for more ideas - A simply awesome apartment with decor ideas you'll love.